Shop trendy and affordable jackets, leotards, tops, bottoms, bags, and more! Get the lowest prices from the start. Jackets start less than $25! Choose from screen print, rhinestones, sparkle vinyl, embroidery, or a special combo of mixed media. 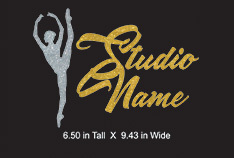 Send us your logo or artwork for a custom quote on your embellishment. Contact us at custom@discountdance.com to get started. You’ll receive a digital proof and price quote for approval. Most quotes take 2 weeks, and most orders take 3 weeks for production from the date of approval. 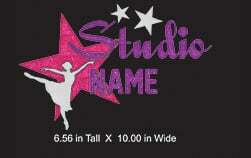 Screen printing is an affordable way to customize dancewear and gear with your artwork! Screen printing works on stretchy garments like leotards, leggings, and tops. Screen print colors will be matched to your artwork, unless otherwise noted. Price quotes will be based on the number of colors in your design, and the quantity of garments to be printed. There is no minimum order, but price breaks do apply starting at 12 pieces per order, and prices decrease for every additional quantity of 12. We’ll provide a custom quote for your creation! Embroidery is a popular choice when you want a fine, polished look for your customization. Our embroidery specialists will convert your artwork into a digitized design that can be stitched onto a variety of garments. Colors will be based on the artwork provided, and custom quotes will be based on the stitches for your design. 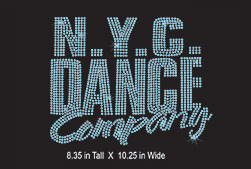 Glitter vinyl brings sparkle to your logo, and has been a popular embellishment combined with rhinestone accents. Choose from the glitter vinyl colors listed below. Vinyl works best on garments like jackets, shirts, and pants that don’t have a great amount of stretch. 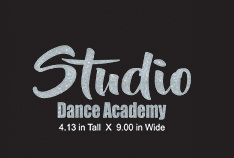 The glitter vinyl is durable and maintains sparkle with regular wear. A custom quote will be based on the number of colors and complexity of your design. Looking for maximum bling? 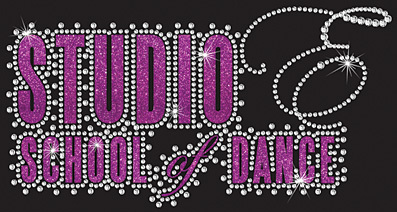 Have your artwork designed in all rhinestones, or with rhinestone accents for an extra-special embellishment. 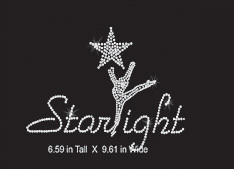 Choose from rhinestone colors listed below. 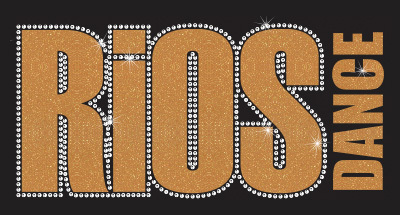 Rhinestones work on a wide variety of garments. 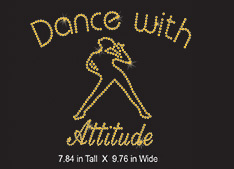 A custom quote will be based on your artwork, the color, size, and quantity of rhinestones in the design. Matte vinyl is applied by heat press, and works well on garments like jackets, shirts, and pants that don’t have a great amount of stretch. Colors are vibrant, and available as listed below. A custom quote will be based on the number of colors and complexity of your design. 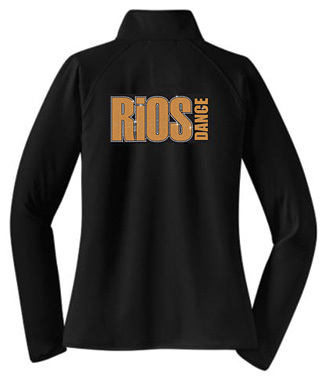 Individualize your jackets or shirts with names printed in screen print, embroidery, rhinestone, or vinyl. We’ll help you choose the right embellishment type for your budget, and choose from available fonts for your desired look. Custom quotes for names will provided. We can help you create a custom look if you don’t have a logo or vector-ready artwork already created. Affordable custom design fees or digitizing fees may apply, and will be quoted for your order. Contact us for custom design information. Popular design trends for warm-ups, and studio logo wear! Get a custom quote today. Email custom@discountdance.com to get started. Popular design trends for warm-ups and studio logo wear! Get a custom quote today. Email custom@discountdance.com or call 1-800-886-8881 to get started. Custom orders are limited to a total of 3 artwork variations per design to be mocked up for approval. This includes variations on color, embellishment type, font, text and artwork/logo designs. Art work variation requests must be made at the start of the initial quote. Allow approximately 10 business days for artwork mock-up and price quote to be generated and e-mailed to the customer. A maximum of 2 revisions will be allowed on artwork mock-ups before final customer approval. Revisions will require an additional 10 business days to process. Revisions may cause delay to final delivery date. Revisions may not be made after final customer approval on artwork. This includes revisions to color, embellishment type, font, text, and artwork/logo designs. Artwork mock-up must have final customer approval at least 21 days before the customer’s needed delivery date. Artwork approved less than 21 days before the customer’s needed delivery date will incur additional fees for Rush Services and Expedited Shipment. Order will go into production after final customer approval. Average production time is approximately 21 days. Absolutely no artwork revisions will be accepted after final customer approval.